Ugg's Best-Selling Slippers Are on a Rare Sale — Get 33% Off! Ugg’s Best-Selling Slippers Are on a Rare Sale — Get 33% Off! Looking to step into style? We’d advise slipping into the most comfortable staple, the UGG Coquette Slipper. But let’s be clear, don’t call it a comeback… they’ve always been here. The revival of Uggs is not what we wanted, but what the world needed. It’s as if we unknowingly jumped into a time machine, in the best possible way. Slipping back into a pair of Uggs is quite literally taking a walk (or stride) down memory lane. Alive are the days when we once again are pondering: to roll (the boot) or not to roll? 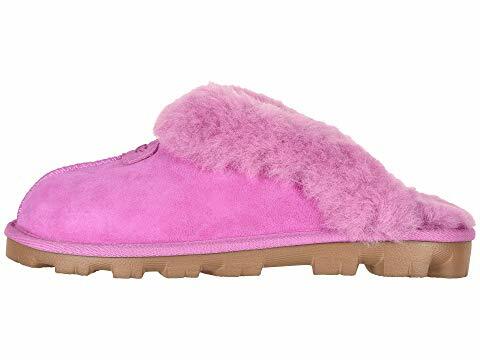 See it: Pick up the Ugg Coquette Slippers with prices starting at $80 at Zappos! While they may remind of middle school and hanging with our “crew” on a Saturday night as Lil Jon & the Ying Yangs Twins play in the background, hear us out. Just as “Get Low” has stood the test of time, Uggs have, too. Sure, we’re no longer pairing our Uggs with denim mini skirts, spaghetti strap camis and bold nameplate bucket belts. But Uggs have still found a way into our wardrobes. Before we know it, we’re adults. Sure, everything is rapidly changing. The one constant? Our lifelong, lifeline, our most beloved friend: our Uggs. Nowadays, we’re reaching for practical. We now reserve those over-the-knee boots for our occasional Saturday morning struggles and we slip on the Coquette slippers. Whether it’s the morning commute (saving us from those uber uncomfortable heels! ), that awful breakup which left us completely paralyzed (and wondering: will we ever be able to step outside again) or even our favorite Sunday morning brunch with dad (the best! ), the Coquette slippers have, and will always be there. It will comfort, protect and provide us our footing every single time we feel as if we’ve lost it. Has anyone ever mentioned that home is not a place but a feeling? Ugg Coquette Slippers are the epitome of that. The Coquette Slippers embrace the slipper we all grew up with, but put their own twist on it. The interior is made completely of sheepskin and has our wondering if: heaven is not a place but a shoe. The signature Twinface sheepskin provides maximum softness and comfort. Absolutely amazing! In terms of sizing, the fit should be snug. This shoe was built with a footbed in mind, which means, it will literally mold to any foot. Our minds are blown! The durable nylon binding and easy to slip-on-style style mixed with their luxurious shearling lining has us grabbing for this slipper without a second thought! Days are unpredictable, shoes shouldn’t be. The Coquette slippers are a guaranteed survival on even our toughest of days. The sheepskin sock liner wicks moisture away, allowing air circulation will not only keep our feet breathing (even if we can’t!) but dry. No need to fret, or sweat! Treadlite by Ugg is a specifically designed system to provide support on the outsole of the shoe to deliver traction control. So we won’t be slipping in these slippers! Shoppers can be put at ease, we’re here to help find everyone’s color match. The slipper comes in ten different colors which means there is a shade for everyone. There’s Sunset which is a very (very) diluted peach-hue which is soft and feminine. Then there’s Succulent, which is a sky blue-hue and bit more of a stand-out choice. Followed by Seal which is a grayish-hue, Sand which is a very versatile honey-brown, Amberlight which is a pale pink/tangerine-hue and Redwood which is a burnt orange/reddish-hue. The boldest of the bunch? By far, Bodacious, which is a bubble-gum pink/bright fuschia-hue. It not for the faint of heart and we love! Last but not least, let’s not forget the basic colors that shoppers can’t go wrong with. It is also offered in grey, chestnut, and black. Moral of the story? 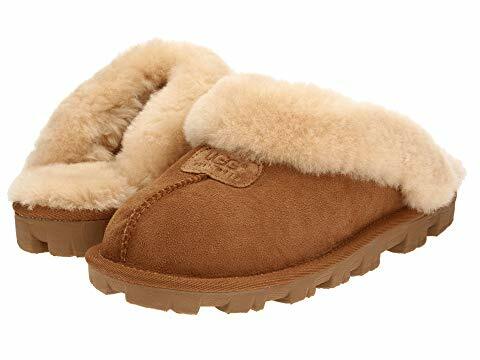 No matter what part of life shoppers are entering, Zappo’s UGG Coquette Slippers are waiting to step you into the next phase in style and comfort — and may even give some nostalgia! See it: Pick up the UGG Coquette Slippers with prices starting at $80 at Zappos! Not your style? Check out additional UGG styles at Zappos!